This view of Mercury’s north polar region shows the drastic range of temperatures that are seen at the Solar System’s innermost planet. The red areas are greater than 400 K (127° Celsius) while the purple areas are about 50 k (-223° Celsius). 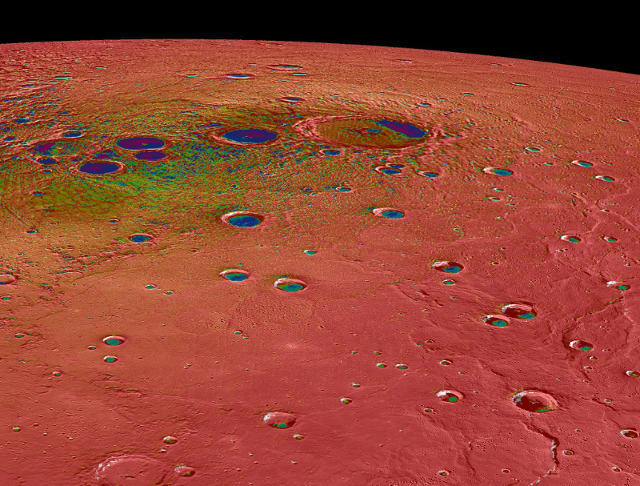 While the extremely hot areas seem easy to fathom, the craters near Mercury’s poles have regions that remain permanently in shadow, and in these regions even the maximum temperatures can be extremely low. 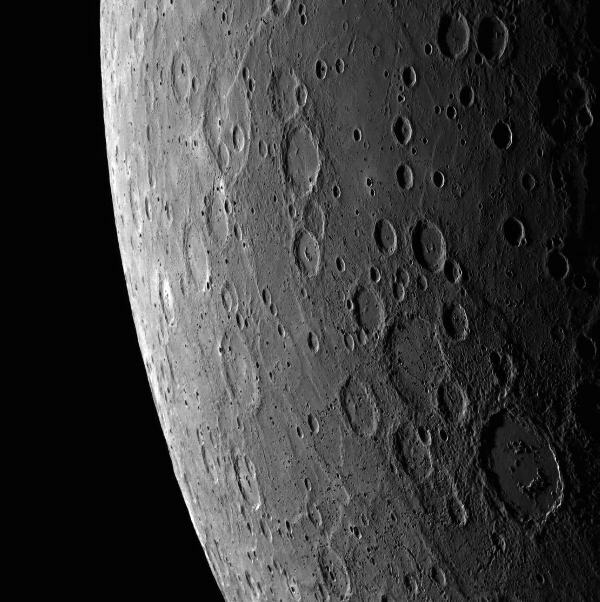 This picture was taken by the MESSENGER spacecraft using its Mercury Dual Imaging System (MDIS). The Prokofiev crater is the largest one in this picture and can be seen near the top center of the image. It has a diameter of 112 km and can have temperatures below 100 K (-173° clesius) with stable water ice. The planet Mercury is chalk full of craters and basins resulting from impacts from all sorts of cosmic debris. This view of the planet taken by the Messenger spacecraft’s wide angle camera shows the landscape with four such impact features. Starting at the lower right we have the Balanchine crater. Near the center of this image is the Ailey crater with its bright floor, resulting from a diverse subsurface composition. 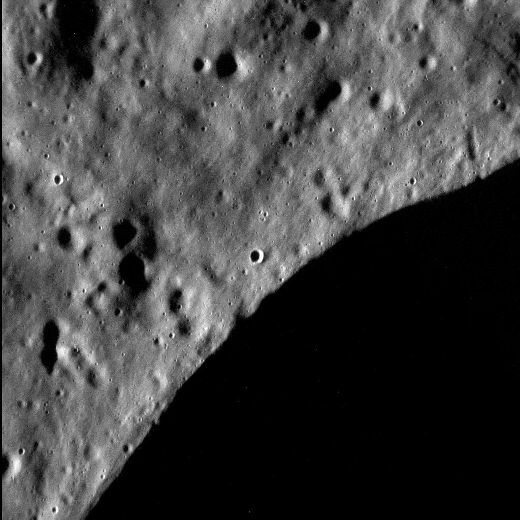 At the lower left edge of the above picture we have the Poe crater with its dark edges. And lastly we have part of the Caloris basin visible in the foreground of this image. This picture from the volcanic Mendelssohn basin on Mercury provides a good representation of the planet’s pockmarked surface which is full of impact craters of all sizes. 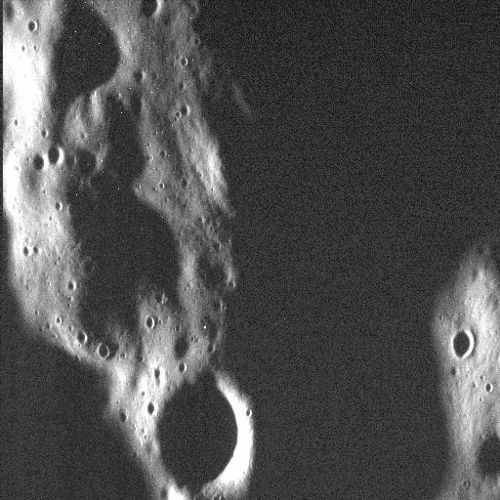 In addition to that we can see a dark abyss from the rim and shadowed wall of a 25 kilometer wide crater that was photographed by the Narrow Angle Camera (NAC) of the Mercury Dual Imaging System (MDIS) on the Messenger probe. We often hear about people seeing shapes in unrelated objects and this is another example of this psychological phenomena (called pareidolia) from the planet Mercury. Here you can see the mountains, the craters and the shadows on this part of Mercury but if you let your imagination loose (a bit) you can also see what looks like a ghost face near the lower right portion of the picture. This scary picture was provided thanks to NASA’s narrow angle camera aboard its MESSENGER space probe. Mercury is the smallest planet in our solar system and closest to (our) Sun. Its surface is pockmarked with craters of varying size, resulting from what we assume was a heavy dose of asteroids, comets and other space matter crashing into it. 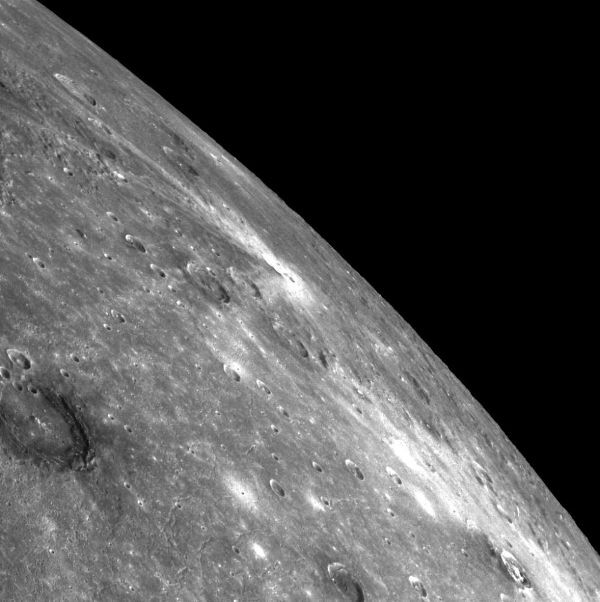 This picture was taken by the Messenger space probe which has been studying Mercury for over ten years. At the bottom right of this picture is the Alver crater, while the 760 kilometer long Belgica Rupes region can be seen at the top.